Transporting swine around the county or around the country requires special considerations. Factors which are unimportant for other species of livestock may be key to keeping pigs comfortable and well, and in reducing mortalities. First, consider the potential for disease; swine are more susceptible to stress-related illness during the transportation process, so steps must be taken to reduce stress. The Food and Agricultural Organisation of the United Nations lists several top concerns: PSE pork; heat stroke; heart failure; sunburn; suffocation and respiratory distress, as top concerns. Photo: Izvora. 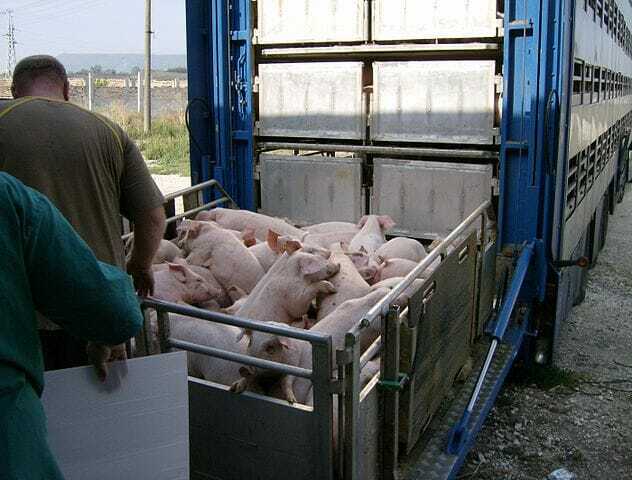 Pigs being loaded into transport in Germany. When transporting swine, the United Nations suggests a minimum space based on the size and age of pig. Swine of all ages are more easily taken sick by temperature and humidity changes than other species so a well-ventilated truck, which can protect pigs from rain, extreme heat and the elements, is ideal. Additionally, the frequent transportation of sows or boars is a concern, primarily because it increases the risk of disease spreading from one farm to another. Pigs should not travel with other species. A number of regulations exist worldwide for the transport of sows, boars, and piglets. Variations occur by country and continent but the greatest differences account for broad temperature ranges. Other variations in law are based on the age of the regulation. In the US, laws dating back to 1973 are still applied and provide direction for transporting pigs by train. The welfare of the animal is often stated in any regulations or laws regarding animal transport. Subjects such as food, water, space, and temperature are addressed most frequently in all areas, second only to swine comfort and space to lie or stand. Provided below is an overview of animal transportation regulations in Canada, the Europe, the UK and the US for comparison. Pigs may be transported at a wide range of weights and ages. From as small as 5 kg (10 pounds) to as large as 300 kg (600 pounds) – in the European Union and the United Kingdom pigs must be over 10 kg. Loading ramp slope is recommended to be a maximum of 20 degrees (as in the EU and UK). Transport swine lying down to allow for proper loading density and comfortable pig transport (as in the EU, UK). Federal agencies and humane societies recommend picking a livestock transportation company which has undertaken the Certified Livestock Transport (CLT) Training Program (Mandatory training and certification may apply in the EU and UK). Swine may travel without food and water from the point of loading to the final destination for up to 36 hours, however, breaks every 4 hours are recommended. The first legislation protecting animals during transport was adopted in 1977. The current legislation was last revised in 1995. It is presently under review by the European Commission. Travel time must be limited to 8 hours but an extension may be permitted upon approval of a route plan. An official veterinarian must approve the route plan. If specific time limits are extended, feeding, watering, and resting of animals during transportation must be arranged. Total travel time may be up to 24 hours if that includes the end destination and rest stops. If more than one rest stop is required animals must be unloaded. Pigs must have continuous access to water. Transporters of swine must get authorisation from their national authority for any journey over 65 km. EU regulations apply and additional guidelines include driver and or handler training on the animal welfare rules. Journeys over 65 km must include Certificates of Competence. Simple end-to-end destination transportation for swine must not exceed 8 hours unless specific conditions (as mentioned above) are met (as per EU regulations). At the end destination, pigs must be fed, watered and rested for a minimum of 48 hours prior to slaughter, sale, or further transportation. Transporters carrying swine in excess of 8 hours must have vehicles inspected and approved according to specific regulations. Ramp slopes must be at an angle of no more than 20 degrees (as in Canada, EU). Pigs in their pens must be able to lie down or stand up while in transport (as in Canada, EU). Piglets and weaners are restricted from extended travel. The 1873 Act or '28 Hour Rule' was the first legislation passed protecting animals in transport. It was put into law by 1905. Thirty-six states in the US have their own specific regulations. Food, water, and rest must be provided to livestock after 28 hours of transportation. A suitable place for offloading (to rest) swine is not defined in the law. Extensions can be made for up to 36 hours of pre-water, rest and food. Swine must receive food, water, and rest for 5 consecutive hours upon reaching their destination. Most of the foregoing regulations do not apply if swine are transported in a truck where they have continuous access to food, water, and resting positions. Time spent loading and unloading swine is not counted toward the maximum transportation time.